[Austen Ivereigh] Pope Francis yesterday sent media and commentators into a tailspin after calling for all priests to be granted the faculty to absolve the sin of abortion during the Year of Mercy (see Crux). The bold gesture, which was intended to send a clear message about God’s unconditional forgiveness, left many experts scrambling to work out just what it was saying, if it was indeed unprecedented, or if it were even saying anything new. Buried in the announcement — contained in a letter to the Pontifical Council for the New Evangelisation — was an olive branch to the breakaway traditionalist Society of St Pius X, which was also open to different interpretations. In the letter Pope Francis made clear that this was a response to the prevalence of abortion, which had led to a dulling of conscience. In some cases, women aborted without a proper awareness of what they are doing, while others did so under extreme pressure, believing that they had no option. One of the serious problems of our time is clearly the changed relationship with respect to life. A widespread and insensitive mentality has led to the loss of the proper personal and social sensitivity to welcome new life. The tragedy of abortion is experienced by some with a superficial awareness, as if not realizing the extreme harm that such an act entails. Many others, on the other hand, although experiencing this moment as a defeat, believe that they have no other option. I think in particular of all the women who have resorted to abortion. 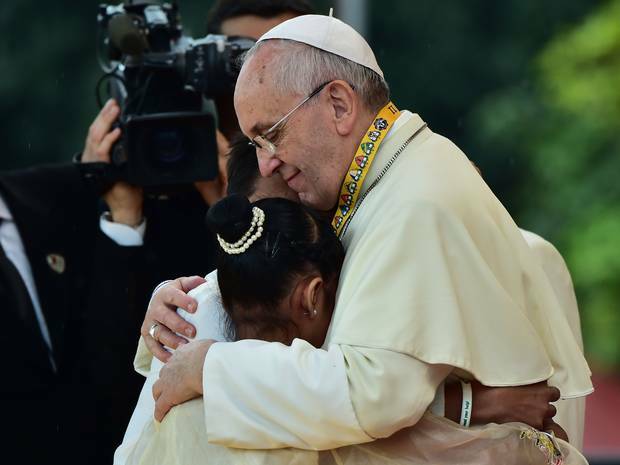 Pope Francis clearly sees these women not as perpetrators of a crime, but as victims in need of help and healing. I am well aware of the pressure that has led them to this decision. I know that it is an existential and moral ordeal. I have met so many women who bear in their heart the scar of this agonizing and painful decision. What has happened is profoundly unjust; yet only understanding the truth of it can enable one not to lose hope. The forgiveness of God cannot be denied to one who has repented, especially when that person approaches the Sacrament of Confession with a sincere heart in order to obtain reconciliation with the Father. For this reason too, I have decided, notwithstanding anything to the contrary, to concede to all priests for the Jubilee Year the discretion to absolve of the sin of abortion those who have procured it and who, with contrite heart, seek forgiveness for it. May priests fulfil this great task by expressing words of genuine welcome combined with a reflection that explains the gravity of the sin committed, besides indicating a path of authentic conversion by which to obtain the true and generous forgiveness of the Father who renews all with his presence. The gesture is bold, beautiful, and comes from the heart of the Gospel and Francis’s own deep understanding of the mercy of God. He wants to make it easier for women suffering from the consequences of abortion to approach the confessional and be liberated. Given the beauty and power of the gesture, it seems almost begrudging to point out that, in reality, all priests anyway have the faculty to forgive the sin of abortion. But as well as being a grave sin, abortion is also a crime. This is a complex area canonically, as Edward Peters shows. What priests do not automatically have is the right to lift the penalty of excommunication which in some cases is automatically incurred by an abortion; canonically, this is reserved to the bishop. But in practice, these cases are extremely rare, because the excommunication does not apply when there are serious fears or pressures influencing someone’s decision, or when they do not know all the moral and canonical implications of what they are doing. And in any case, in most western countries at least — certainly in the U.S. and in the U.K. — bishops already “routinely grant” the faculty to priests to lift the penalty through confession (see Washington Post here). This fug of canonical complexity may one good reason why Pope Francis has felt the need to make a simple declaration. For women staying away from the confessional believing they have done something unforgivable which puts them beyond the pale, the Pope’s message to both women and priests could not be clearer — and if it creates canonical ambiguity, that is a secondary matter. Francis sees the Jubilee Year of Mercy as an opportunity to move the merciful face of God to the front and centre of the Church’s offer to the world. Mercy is the key to evangelization — which is why he has entrusted the Holy Year to the Pontifical Council for the New Evangelization. God is misericors, a word that contains both cor (heart) and miseri (the poor, those who suffer, those who long). To declare God as merciful is to recognize that God has a heart for the poor. To experience God’s mercy is to know God. The full significance — canonically, ecumenically, and theologically — of yesterday’s bold move will be picked over for a long time. But its real point is to bring healing. Many suffer hugely as result of abortion, but it is a silent suffering, that in contemporary society can barely ever be acknowledged. Those who have taken the lives of the unborn long to unburden themselves, to admit to their sorrow, confusion and regret, and to find healing. This is what the Church — God’s heart amidst humanity — exists for: a battlefield hospital, ready to tend the wounds inflicted by contemporary mythology about individual sovereignty. Yet many are persuaded — by the strident voices asserting women’s “right” to abort — that the Catholic Church is a place of judgement and condemnation. If just some among these women in pain hear a different message — which given yesterday’s massive coverage is very likely; and if among those some take up this offer of liberation from guilt and a path back to God — which is also very likely; then Pope Francis’s grand gesture will have succeeded spectacularly. This entry was posted in abortion, mercy, Pope Francis. Bookmark the permalink.